Long-route bus services from Mohakhali terminal remained suspended since Tuesday morning protesting the assaulting on a fellow driver, UNB reports. 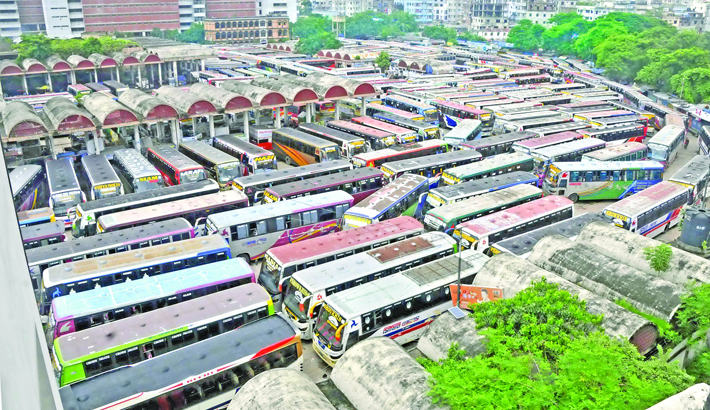 No long route buses left the terminal in the morning, said Traffic Inspector Akhter Hossain. Locals said an altercation took place between the driver of an ‘Ena Paribahan’ bus and local people over using hydraulic horn in front of icddr,b Mohakhali office around 11pm on Monday. At one stage, the bus driver was hit on his head, they said. Being angered over the incident, the bus drivers and their helpers put a barricade on the road at night halting vehicular movement on Tejgaon and Mohakhali areas for hours. Later, police rushed in and brought the situation under control.